As they celebrate five years in the industry, GMA Artist Center’s millennial trio JBK will hold their first major solo concert entitled Just Be Kind on March 29 at the Music Museum. JBK members Joshua Bulot, Bryan del Rosario, and Kim Ordonio will hold their first major solo concert entitled ‘Just Be Kind’ on March 29 at the Music Museum. 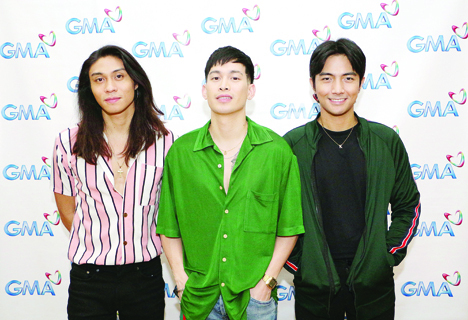 The Kapuso all-male group, composed of Joshua Bulot, Bryan del Rosario, and Kim Ordonio, is the first Filipino boyband to compete in the international stage as the “Millennial Trio” at The X-Factor UK in 2017. The GMAAC stars quipped on what fans should look forward to in their concert. “There are so many things that they should look forward to in our concert. Since it’s our first major concert, we really prepared well, including yung mga hugot namin na pati mga fans makaka-relate,” shared Joshua. “We personally chose the lineup of songs that we’re performing come the big night. You’ll be hearing songs na never namin kinanta sa mga live gigs before such as songs from Queen,” added Bryan. They also underwent various trainings in preparation for the concert, “We always review our songs before we end our day. We are currently doing vocal lessons and dance rehearsals para paghandaan yung transition ng bawat kanta,” said Kim. The concert promises a night of remarkable performances as special guests Asia’s Pop Sweetheart Julie Anne San Jose, Bradley Holmes, Kakai Bautista and the cast of Rak of Aegis including Nina Espinosa join JBK on stage. Just Be Kind is produced by Winstruck Events Production. Ticket prices are available at P1,500 for VIP, P1,000 for Orchestra, and P500 for Balcony via www.ticketworld.com.ph or contact 0917-862-1313 for inquiries and ticket purchases. The concert proceeds will be donated to Mabuhay Desert Foundation, YesPinoy Foundation and HERO Foundation, Inc.